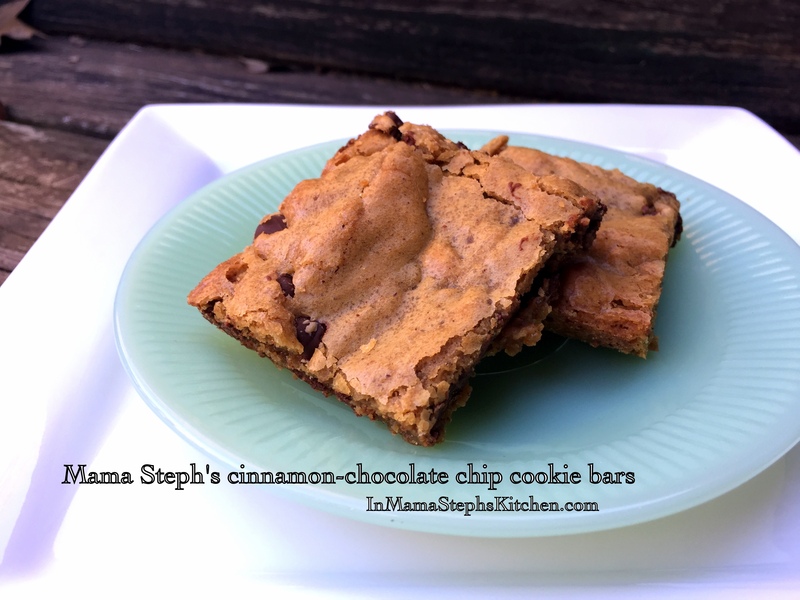 My cinnamon-chocolate chip cookie bars are so simple to make, and they feature ingredients which you likely already have in your kitchen, which everyone appreciates, of course. The lovely result of the easy, no-mixer-needed preparation is a pan of nicely dense, chewy bars with a lovely cinnamon flavor, accented by nuggets of velvety smooth, chocolate sweetness. They’re not as thick as brownies or blondies, by the way. Imagine a thick, chewy cookie loaded with chocolate and a magical warm touch of cinnamon…that’s what this gives you, in bar form. I appreciate the ease of making bars when I don’t have time to keep scooping cookies, rotating pans of cookies in and out of the oven, setting timer after timer. Stick these babies in the oven, and in 20 minutes, BAM, you’ve got cookie bars! 1. Preheat oven to 350, and spray a 9×13 baking pan with cooking spray, or coat with butter. (See tip below)2. Melt butter in a bowl in the microwave, and allow it to cool slightly while you assemble other ingredients. 3. Combine flour, baking powder and salt in a bowl, and whisk to combine. 4. Combine butter, eggs, sugar, and vanilla in a larger mixing bowl, stirring briskly until smooth. 5. Add the flour mixture to the butter mixture, stirring until no more flour is visible in the batter. 7. Bake for 20 minutes, or until a toothpick inserted in center comes out clean.Allow the bars to cool completely in the pan, then cut into squares. Tip: Line the pan with aluminum foil, leaving extra length on each end as “handles” to assist in lifting the bars out of pan when cool. Spray the foil with cooking spray, then proceed as usual. Lift bars out when cool, and place on cutting board. Remove foil and cut bars with serrated knife. It’s much easier cutting into nice, straight squares with this method, as well as easier cleanup. Chunky Valentine blondiesWhat’s your favorite afternoon snack? Next Post Chocolate cupcakes: What’s not to love?